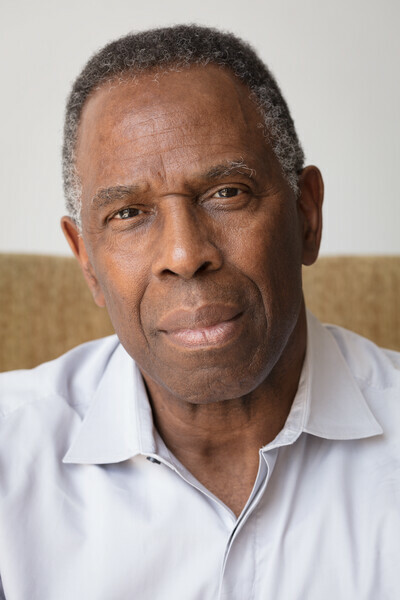 A pivotal figure in the field of Conceptual Art, Charles Gaines’ body of work engages formulas and systems that interrogate relationships between the objective and the subjective realms. Using a generative approach to create series of works in a variety of mediums, he has built a bridge between the early conceptual artists of the 1960s and 1970s and subsequent generations of artists pushing the limits of conceptualism today. 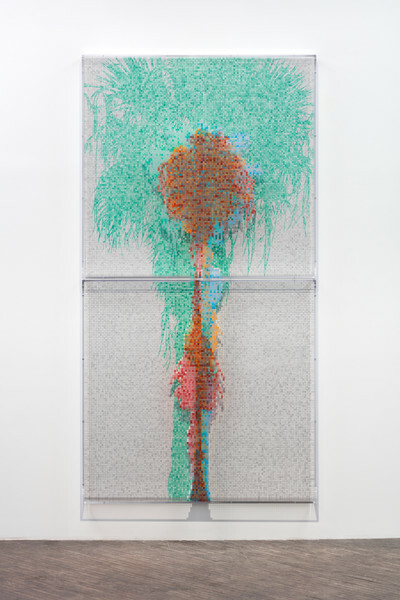 Working both within the system and against it, Gaines points to the tensions between the empirical objective and the viewers’ subjective response. The concept of identity politics has in played a central role within Gaines’ oeuvre, and the radical approach he employs addresses issues of race in ways that transcend the limits of representation. His recent work continues to use this system with sociopolitical motivations at the forefront. ‘Faces 1: Identity Politics’ (2018) is a triptych of colorful portraits of historical icons and thinkers, from Aristotle to Maria W. Stewart and bell hooks. Gaines reduces the images to pixelated outlines, layered among the faces of the preceding portraits to create a palimpsest of faces, employing this system in a critique of representation and the attachment of meaning to images. 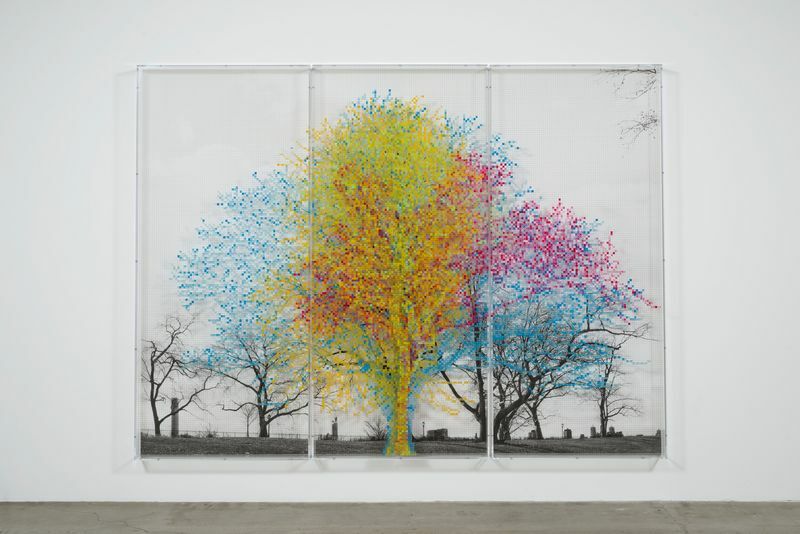 Gaines lives and works in Los Angeles, where he is a member of the CalArts School of Art faculty. He has been the subject of numerous exhibitions in the United States and internationally, and his work is in prominent public collections including the Museum of Modern Art, New York NY, the Whitney Museum of American Art, New York NY, the Studio Museum in Harlem, New York NY and the Los Angeles County Museum of Art, Los Angeles CA. Gaines’ work was presented at the Venice Biennale in 2007 and 2015. 1977 National Endowment for the Arts, Washington D.C.
2015 Abramovic, Marina, Bove, Carol + [et al. ], ‘Akademie X. Lessons in Art + Life’, London: Phaidon Press Limited, 2015, pp. 98-103, ill.
2018 ___, in: Artforum, November 2018, ill.
Gaines, Malik, ‘The Passion of St. Charles’, in: Studio, Summer / Fall 2014, p. 45, ill.
Estefan, Kareem, ‘Review. Charles Gaines at Paula Cooper Gallery’, in: Art in America, January 2014, pp. 99-100, ill.
Philips, Rowan Ricardo, ‘Critics’ Pick. Charles Gaines’, on: www.artforum.com, September 2013, ill.
Plagens, Peter, ‘Persuasion in Pieces and Disarray. Charles Gaines. Notes on Social Justice’, in: The Wall Street Journal, 28-29 September 2013, p. A20, ill.
Cotter, Holland, ‘Art in Review. Charles Gaines, “Notes on Social Justice”’, in: The New York Times, 27 September 2013, p. C32, ill.
Tani, Ellen Yoshi, ‘Charles Gaines and Sol Lewitt at Paula Cooper NYC’, on: www.dailyserving.com, 17 September 2013, ill.
Helfand, Glen, ‘Lurid Stories. Charles Gaines’, in: The San Francisco Bay Guardian, vol. 35, no. 40, 4-10 July 2001, p. 73.